Let’s get this out of the way up front: I really don’t like the song Jingle Bells. Seriously, if someone hadn’t gone and written The Twelve Days of Christmas I’d argue Jingle Bells was the worst of all the classic holidays songs. Even those versions which I consider my favorites, like the one just below by Ella or the one that ends this post by the Puccini Sisters, are still among the least favorites on my annual holiday playlist. I dislike it so much that I’m actually choosing a picture of Teletubbies standing by a Christmas tree as this post’s opening image just to underscore just how insipid I think this song is. Still, I’m adding it to the list because as much as I dislike the song, I love the story behind it. As our Virtual Musical Advent Calendar will show us, there are a surprising number of songs in the classic Christmas song canon that were never meant to be Christmas songs. Jingle Bells, however, is unique among that set for being one of the few Christmas ditties that was originally written to commemorate a completely different holiday altogether. And as odd as that might seem considering how deeply tied to Christmas Jingle Bells has become over the years, it is all the more so when considering its author’s pedigree. But before we get to Jingle Bells’ author, a short aside is probably required. As we shall see later in this series, the “traditional” pious, joyful, and family-centered celebration of Christmas — even among the faithful — is a thoroughly modern invention. More than that, Christmas becoming Christmas was the result of a very long and deliberate battle to make it so — and the biggest foot soldiers in this battle were the Boston Unitarians of the mid-19th-century. We’ll look at that battle more closely as we get into this series, but this scratch-the-surface understanding is important context for the story of Jingle Bells and its author, James Lord Pierpont. A displaced Yankee and all-round scoundrel, Pierpont worked his whole life to avoid being a product of his birthplace and era. Sadly for him, however, destiny wants what destiny wants. Born and raised in Boston in the early 19th century, Pierpont was something of a starry-eyed entrepreneur who left a trail of failed get-rich-quick schemes (and disgruntled creditors) in his wake. At the age of 14, he tired of boarding school life and ran away to join a whaling ship’s crew in hopes of making his fortune. When poverty followed, he joined the Navy with the plan of becoming an officer and parlaying that rank into lucrative business opportunities. Three years later, penniless and not commissioned, he quit the Navy and returned to his father’s church, whereupon he married a member of its congregation. Three years and three children later, Pierpont walked out on his family to seek his fortune in the California gold rush, a scheme which turned out to be exactly as fruitful as all of the others before it. He tried his hand at several businesses while there, including banking and photography, but none panned out. When a fire destroyed most of his earthly possessions, he returned to Boston and his family yet again, begging forgiveness and to be let back into the fold. Shortly thereafter, his wife passed away, and Pierpont went to live with his brother in Savannah, Georgia and try his hand at becoming a professional songwriter. Ever the opportunist, Pierpont largely wrote songs specifically catered to his adopted home and in short order he began to churn out songs for minstrel shows. As tensions between the North and South began to boil over, the Boston native began to market himself as a writer of patriotic Confederacy numbers, including the God-awfully terrible We Conquer or Die and Strike For the South. (Which, when you think about it, kind of makes James Lord Pierpont the 18th century racist version of Lee Greenwood.) It should be noted that this inclination toward secessionist lyrics had little to do with any political leanings one way of the other on Pierpont’s part. Rather, he wrote them because it was his belief that the Confederacy would win the war, and that his pro-South songs would both make him rich and pay royalties to his children long after his death. Even Jingle Bells, his life’s single lasting success, is something of an homage to his terrible business foresight. At the time he wrote the song, the country was still debating whether or not it was going to embrace the revolutionary-at-the-time concept of celebrating Christmas as a religious and family holiday. That battle’s main front was Pierpont’s hometown of Boston, and as such it was a debate he knew well. Pierpont’s business instincts told him the new Christmas-as-a-holiday thing was going to be a passing fancy, and that the holiday where the real music-royalty money would be made over time was Thanksgiving. Along with his belief in a Confederacy victory, he staked his writing fortunes on this Thanksgiving strategy. So it was that Pierpont wrote Jingle Bells for the one single universally-celebrated American holiday that is almost entirely disconnected to music, and not the one that falls on December 25. And yet somehow, despite a lifetime of bad foresight where commerce was concerned, success somehow managed to seek out and find Pierpont despite his best efforts. Regretfully for him and his ancestors, however, it did so well after his death in 1893. Jingle Bells would not become a beloved classic until the 20th century, long after his children had ceased bothering to renew the copyright, when it had entered the public domain. The song we sing today is exactly the same one Pierpont penned, save two very minor details: It was originally titled One-Horse Open Sleigh, and Pierpont’s version read “oh what joy it is to ride.” It began to grow in popularity from the 1910s through the 1930s, but it would be Bing Crosby and the Andrews Sister’s 1943 recording that would catapult Jingle Bells into its current universally-known status. The number of diverse artists who have recorded Jingle Bells over the year is sort of astonishing, especially when you consider its Mary-Had-A-Little-Lamb-like melodic simplicity and the utter lack of lyrical depth with which an artist has to work. Notable (and, frankly, curious) examples of these artists include the Beatles, Sinatra, Yello, Lisa Loeb, Duke Ellington, Chicago, and Pearl Jam. It has been famously played off-key by Schroeder, and annoyingly recorded by dogs and cats alike. Bobby Helms used it as inspiration for one of the worst pop-rock Christmas songs ever. It has become testimony to Batman’s body odor. It was even the first song ever sung in outer space. Plus, it’s the only Christmas song where we all get to yell “HEY!” in the middle. That seems like it should count for something. A minstrel show was a type of live comedy/variety production that was popular in the South (and to a much lesser degree in the North) both before and after the Civil War. It featured white performers in blackface singing, dancing, telling jokes and performing slapstick. The songs and jokes varied from show to show, but all were centered on the lampooning of African Americans for being lazy, stupid, superstitious, and dishonest. 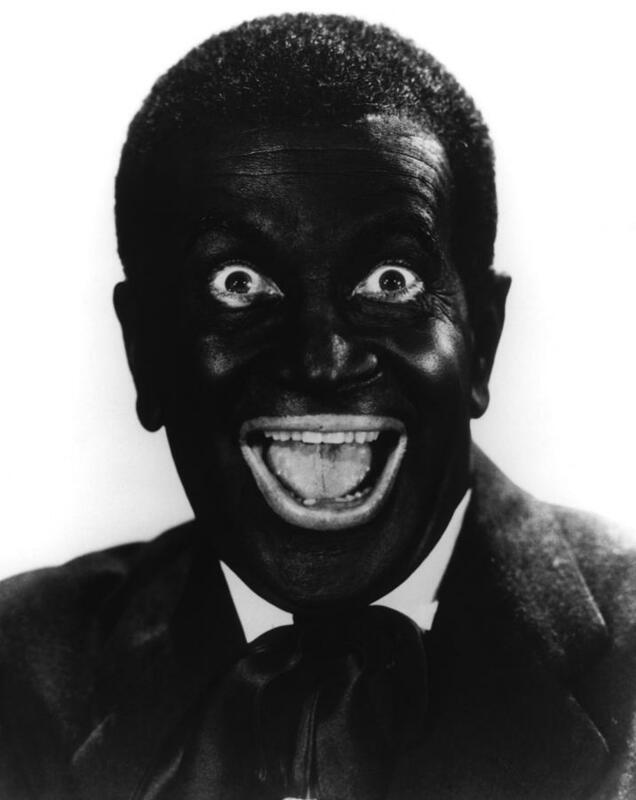 The first motion picture that featured sound, the thrice–remade Jazz Singer, featured Al Jolson as a minstrel show performer. Jolson’s character was not meant to be ironic or satiric. The movie was made in 1927, which gives you an idea of how long this abysmal practice was considered acceptable. Also, we only sing the chorus; the verses are completely forgotten. Just like Take Me Out to the Ball Game.